This AA-Series is the heat source for the Gun Lake Wastewater Treatment Plant (WWTP). The facility it serves is responsible for draining the vehicles that clean out the area's septic tanks, so the unit had to be equipped to handle the harsh environment. The gases produced in this process could not be subjected to any open flames, so an electric coil was chosen to heat the space. The unit was equipped with an all-aluminum fan to ensure that it withstood the corrosive agents in the environment. To prolong its life, the motor provided was totally enclosed, and the remote panel that shipped loose with the unit was mounted in an entirely different area of the facility, again to protect it from the harmful contaminants at the plant. 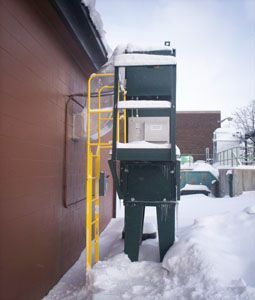 A service platform and ladder were also shipped with the unit to allow for easy access to the controls.